April 17 (Bloomberg) -- Crude oil fell and was poised for its biggest weekly decline since February, amid forecasts the recession will curb demand at a time when U.S. inventories are already at their highest in almost 19 years. U.S. crude-oil inventories rose 5.67 million barrels to 366.7 million last week, the highest since September 1990, an Energy Department report showed April 15. The International Energy Agency reported on April 10 that worldwide consumption will shrink by 2.8 percent in 2009 as the global economy contracts by 1.4 percent. “I think there’s potential for oil prices to slide off the current plateau and fall back to perhaps a number like $40 a barrel, just because inventories are at such an elevated level and may not have peaked yet,” said Tim Evans, an energy analyst with Citi Futures Perspective in New York. Crude oil for May delivery fell as much as 48 cents, or 1 percent, to $49.50 a barrel and was at $49.74 at 9:19 a.m. Sydney time on the New York Mercantile Exchange. Oil has dropped 5 percent this week, poised for its sharpest decline since the week ended Feb. 13. Oil in New York has tumbled 66 percent from a record $147.27 in July as the recession in major consuming countries curbed fuel demand. U.S. fuel demand in the first quarter fell to the lowest for the period in 11 years, the American Petroleum Institute said in a monthly report yesterday. Deliveries of petroleum products, a measure of consumption, averaged 19.2 million barrels a day, 3.4 percent less than during the same period in 2008, the industry-funded API said. Prices are up 12 percent so far this year and rose 73 cents, or 1.5 percent, yesterday to settle at $49.98 a barrel. Oil climbed as much as 2.5 percent after the Labor Department reported that claims decreased by 53,000 to 610,000 in the week ended April 11, the fewest since January. Chinese industrial production expanded by 8.3 percent in March from a year earlier, up from 3.8 percent in the first two months, the statistics bureau said yesterday in Beijing. The Federal Reserve said in its Beige Book business survey April 15 that economic contractions were slowing or stabilizing in San Francisco, the largest district, as well as in New York, Chicago, Kansas City and Dallas. The IEA’s forecast is excessive and “badly calibrated,” according to analysts at Barclays Capital. The bank, the Organization of Petroleum Exporting Countries and the U.S. Energy Information Administration predict demand will decline about half as much. OPEC will load about 22.2 million barrels a day in the four weeks ending May 2, down from 22.8 million a day in the month ended April 4, Oil Movements, the Halifax, England-based tanker- tracker, said yesterday in a report. West Texas Intermediate crude oil, the U.S. benchmark, will average $45 a barrel in 2009, according to a report from Moody’s Investors Service. That’s down from the rating company’s previous estimate that prices would average $50 this year. WTI is forecast to average $50 in 2010, down from a previous forecast of $55. Brent crude oil for June settlement rose 62 cents, or 1.2 percent, to $53.06 a barrel on London’s ICE Futures Europe exchange. April 16 (Bloomberg) -- Gold and silver fell to the lowest prices in a week on speculation that the pace of inflation will be slower than investors expected, eroding demand for the precious metals as a store of value. U.S. consumer prices slipped in March to the first 12-month decline since 1955, the Labor Department said yesterday. The euro declined for a third straight day against the dollar, the longest losing streak in six weeks, as industrial output fell. Gold jumped 7.8 percent on March 19 on concern that the Federal Reserve’s plans to buy government debt would reignite inflation. Gold futures for June delivery fell $13.70, or 1.5 percent, to $879.80 an ounce on the Comex division of the New York Mercantile Exchange, after touching $877.60, the lowest since April 9. Gold is down 7.2 percent from a year ago. Silver futures for May delivery slid 54.5 cents, or 4.3 percent, to $12.255 an ounce on the Comex, after reaching $12.165, the lowest since April 9. The price is down 33 percent from a year ago. Still, some analysts say gold may be poised to rebound. “Any major further correction in gold will see solid buying -- and that if no correction occurs, Indian demand will pick up strongly in August/September,” John Reade, UBS AG’s head metals strategist in London, said today in a report. India, the world’s biggest buyer of gold, imported 10 metric tons in the first 15 days of April, compared with 24 metric tons in all of April 2008, Reuters reported from Mumbai yesterday, citing Suresh Hundia, head of the Bombay Bullion Association Ltd. India didn’t import any gold last month, compared with 21 tons in March 2008, according to the bullion association, a group of 230 traders. Investors buy gold and other precious metals as a hedge against accelerating consumer prices and a weakening dollar. Investment demand for precious metals slows when consumer prices fall and the dollar strengthens. The dollar gained as much as 0.8 percent against the 16- nation euro, which traded at $1.3172 at 2:50 p.m. in New York. The European Union’s statistics office said industrial output in the euro region fell 18.4 percent in February from a year earlier, the biggest drop since at least 1986, when the data begin. The European Central Bank hasn’t decided whether to follow its counterparts in the U.S. and the U.K. in using printed money to buy assets, a measure known as quantitative easing. Gold may trade near $800 by summer, based on trader sentiment, Perez-Santalla said. This year, gold futures traded as low as $801.50 on Jan. 15 and as high as $1,007.70 on Feb. 20. April 16 (Bloomberg) -- Cash bids for soybeans at export terminals near New Orleans widened their premium relative to futures on the Chicago Board of Trade on increased demand for U.S. supplies from China, the biggest global importer. Today’s so-called spot-basis bid, or premium, for soybeans moved by barge to New Orleans was 46 cents to 52 cents a bushel above the price of May futures, compared with 46 cents to 50 cents yesterday, U.S. Department of Agriculture data show. The premium for delivery next month rose to 54 cents to 55 cents over May futures, from 50 cents to 54 cents yesterday. Bids for June and July delivery rose as much as 3 cents a bushel. Exporters sold 808,300 metric tons of soybeans in the week ended April 9, double the prior four-week average, the USDA reported today. About half of the sales went to China. U.S. exports will reach a record 32.9 million tons this marketing year, up 4.2 percent from the previous year, the USDA said last week. “China has not slowed purchases,” said Garrett Toay, a commercial grain analyst for Toay Commodity Futures Group LLC in Clive, Iowa. “There was talk today that China bought another 10 to 15 cargoes” of U.S. soybeans in recent days for delivery in June and July, Toay said. A cargo of soybeans is usually 50,000 metric tons to 60,000 metric tons. Soybean futures for May delivery jumped 23.5 cents, or 2.3 percent, $10.585 a bushel today on the Chicago Board of Trade, the biggest gain since April 2. The price touched $10.59, the highest for a most-active contract since Jan. 12. The most- active contract rose 1.2 percent last week, the fourth gain in five weeks. China is buying more U.S. soybeans because drought reduced crops in Argentina and farmers in that country are limiting sales in a yearlong battle with the government to cut a 35 percent export tax, Toay said. Production in Argentina, the third-largest exporter of soybeans, will fall to 37 million tons this year, down 20 percent from last year and the lowest in four years, the Buenos Aires Cereals Exchange said yesterday. Drought and pests will trim yields in some areas by 26 percent, the exchange said. U.S. exports also have climbed as drought cut output in Brazil, the second-largest grower after the U.S. Brazil’s production will decline 6.6 percent to 57 million tons, while exports may slip 0.9 percent to 25.14 million tons, the USDA said last week. China’s purchases of U.S. soybeans will remain strong because demand for animal feed and vegetable oil have improved processor profit margins, Toay said. Soybean-oil futures for May delivery on the Dalian Commodity Exchange have risen 15 percent this year and today reached the highest since September. The May soybean-meal contract has risen 28 percent in 2009. Pork output in China, the world’s biggest producer, will rise 5.5 percent to 48.7 million tons this year, from 46.15 million in 2008, the USDA said today in a report. The forecast is up 5.9 percent from an October projection. FKLI April futures contract fall 6.5 points lower to close at 952 as compare to previous trading session with total 11,461 lots traded in the market. FKLI was mainly traded lower during the trading session despite Dow Jones overnight firm closing as most of the regional indices starts to reverse during the trading session. Technically, FKLI seems formed a Dark Cloud candle in the daily price chart after manage to break down from head and shoulder formation in 15min price chart. We expect FKLI would trade lower in the coming trading session provided resistance levels at 967.5 and 974 were not violated. Traders were advice to hold short position around the resistance levels while be extra alert around support levels at 946 and 937 regions. FCPO 3rd month June Futures contract fall RM40 lower to close at RM2358 as compare to previous trading session with 10,403 lots traded in the market. CPO price were opened higher during trading session due to firm overnight soybean oil and crude oil trading were closed firm despite CPO encounter great selling pressure during trading hours. Technically, CPO price break down from previous support levels at RM2440 region after formed at shooting star in the daily chart. We expect CPO price would trade lower in the coming trading session with support levels seen at RM2330 and RM2308 region. Failure to breach support levels shall indicate rebound activities after dropped for 2 consecutive days. Traders were advice to hold short position once the support levels were violated while resistance levels seen at RM2397 and RM2424 regions. Reuters financial clients got an early and exclusive insight from a March 11 analysis that the trillions of dollars allocated for global economic stimulus could do a lot to inflate prices of raw materials in the near-term, without boosting industrial activity. The prescient story ran just before oil, metals and grains markets spiked in early March following months of losses. It illustrated how investors could react early to the expected growth in money supply, even if consumer demand stayed weak -- a pattern proven just weeks later as commodities began rallying even as economic indicators remained down. The Financial Times ran an almost identical piece a day after the Reuters story, which was also reproduced financial and economic websites and newspapers like Jakarta Globe. PARIS/SINGAPORE, April 15 (Reuters) - Chicago soybean futures rose for the fifth straight session on Wednesday as strong Chinese buying and prospects of lower U.S. closing stocks continued to buoy the market. KUALA LUMPUR, April 15 (Reuters) - Malaysian palm futures fell 1.1 percent on Wednesday, easing from an 8-month high notched earlier in the session as some investors booked profits on a rally fuelled by speculation of a drawdown in stocks. "Exports were around the same levels (from last month) but there is talk of lower production and therefore, lower stocks," said a trader with a foreign commodities brokerage. KIEV, April 15 (Reuters) - Sunoil output in Ukraine rose by 27 percent to 695,000 tonnes in January-March 2009 compared with the same period in 2008, the State Statistics Committee said on Wednesday. Sunoil production totalled 242,00 tonnes in March against 216,000 in February. Analysts have said sunoil production is likely to rise to about 2.37 million tonnes in the 2008/09 season from 1.73 million in 2007/08. NEW DELHI, April 15 (Reuters) - India's vegetable oil imports in March rose 27.5 percent as farmers held back rapeseed stocks in the hope of higher prices, while some traders shipped in more oil expecting a rise in the import tax, data showed on Wednesday. Total imports rose to 641,141 tonnes, the Solvent Extractors' Association of India said, led by a 44.5 percent surge in edible oil imports, which was much higher than trade expectations of a 33 percent rise. ISLAMBAD, April 15 (Reuters) - Pakistan has made few purchases of palm oil this month after strong buying in the first quarter led to a glut, and buying is expected to remain slow at present prices, a top industry official said on Wednesday. "The country overbought in the first quarter and stock levels remain very high. Because of the over-buying there's a local glut," said Rasheed Janmohammad, vice-chairman of the Pakistan Edible Oil Refiners Association. "Buying for second quarter, commencing April, shipment was very slow. Buying has been very very slow in the last two weeks." KUALA LUMPUR, April 15 (Reuters) - Exports of Malaysian palm oil products for April 1-15 rose 3.7 percent to 613,677 tonnes from 591,567 tonnes shipped between March 1 and 15, cargo surveyor Intertek Testing Services said on Wednesday. SINGAPORE, April 15 (Reuters) - China's second strategic tie-up with a Japanese trading house may be nominally focused on safeguarding soybean supplies, but the unspoken longer-term aim could be to help Beijing secure low-key corn and wheat imports. For now, China remains as it has been for centuries, self-sufficient in corn and wheat supplies; it also holds massive state stockpiles able to meet any immediate supply shortages. MANILA, April 14 (Reuters) - Global rice trade must increase by at least 10 million tonnes to stabilise prices in the long term, the International Rice Research Institute (IRRI) said on Tuesday. It added that the extra volume should come from exporters outside Asia where surplus output is dwindling. BUENOS AIRES, April 14 (Reuters) - Argentina's decision to scrap tax breaks on soy imports could further reduce crushing activity just as a poor harvest and hoarding by farmers forces processors to slow operations at their plants. Soy output in Argentina, the world's top supplier of soyoil and meal, is seen falling up to 15 percent this year and analysts say the government's crackdown on imported beans, mainly from Paraguay, will aggravate a supply crunch. April 15 (Bloomberg) -- The Organization of Petroleum Exporting Countries cut its forecast for oil demand this year for an eighth successive month as the economic slowdown in the world’s biggest oil consumers worsens. The estimate for 2009 global demand was lowered by 430,000 barrels a day to 84.18 million barrels a day, the producer group said. Demand will contract by 1.37 million barrels a day this year, or 1.6 percent. That’s slightly more than North Africa’s biggest oil supplier Algeria produces. OPEC forecast a decline of 1.2 percent last month. Oil has fallen almost $100 a barrel from a record high of $147.27 a barrel in July as the global crisis dampens demand for the fuel. OPEC’s net oil-export revenue will fall an estimated 51 percent to $476 billion this year, the U.S. Energy Information Administration said yesterday. OPEC will meet in Vienna on May 28 to review production quotas. It agreed in March to keep supply unchanged as members continue to implement record reductions agreed last year, totaling 4.2 million barrels a day, to stem plunging prices. Crude oil for May delivery rose as much as $1.09, or 2.2 percent, to $50.50 a barrel on the New York Mercantile Exchange, trading for $50.32 at 10:23 a.m. London time. The benchmark crude price used by OPEC, derived from the cost of oil produced by each of its 12 members, averaged $45.78 in March, $4.37 or 11 percent higher than February, and was at $51.07 yesterday, OPEC said in its report today. Three-quarters of the downward revision to oil demand came from developed economies, which will see demand fall to 46 million barrels a day. Consumption in those countries will decline 1.5 million barrels a day in 2009, OPEC forecasts, a drop of 3.2 percent compared with 2008. Demand for OPEC’s crude in 2009 will contract by 2.07 million barrels a day to 28.74 million barrels a day, the group said, calculating that figure using its world demand and non- OPEC supply forecasts. That’s about 330,000 barrels a day less than it predicted last month. The International Energy Agency cut its 2009 oil demand forecast last week for an eighth month, reducing its forecast by 1 million barrels a day to 83.4 million barrels a day. The IEA also revised its oil supply forecast from non-OPEC countries, saying it will fall by 320,000 barrels a day. Last month it expected non-OPEC output to be unchanged year-on-year. OPEC cut its forecast for oil supply from outside the group to 50.61 million barrels a day due to lower expectations for China, Mexico, Kazakhstan, Azerbaijan and Vietnam. That still leaves an increase of 290,000 barrels a day, or 0.6 percent, this year over 2008. The IEA said it expects non-OPEC supply to fall to 50.3 million barrels a day in 2009. April 16 (Bloomberg) -- Crude oil rose for the first time this week, as U.S. equities rallied and the Federal Reserve said several of the country’s biggest regional economies saw some moderation in the pace of their decline. Oil gained as much as 1.2 percent after stocks climbed in the last hour of trading yesterday. Fed districts reporting a slower economic decline or signs of stabilization include San Francisco, the largest district, New York, Chicago, Kansas City and Dallas, the Fed said in its Beige Book business survey. Crude oil for May delivery rose 45 cents, or 0.9 percent, to $49.70 a barrel at 9:02 a.m. Sydney time on the New York Mercantile Exchange. Futures have traded between $43.62 and $54.66 a barrel over the past month. Prices are up 11 percent so far this year. Yesterday, oil fell 16 cents, or 0.3 percent, to $49.25 a barrel, the lowest settlement on the Nymex since April 7, after a government report showed that U.S. stockpiles climbed to the highest level in almost 19 years as demand dropped. Oil inventories rose 5.67 million barrels to 366.7 million last week, the highest since September 1990, the Energy Department said yesterday. Total daily fuel demand averaged over the past four weeks was 18.7 million barrels, down 5.2 percent from a year earlier, according to the department. Supplies were forecast to increase by 1.75 million barrels, according to the median of 14 analyst estimates in a Bloomberg News survey. The Standard & Poor’s 500 Index added 1.3 percent to 852.06. The Dow Jones Industrial Average jumped 109.44 points, or 1.4 percent, to 8,029.62. The Nasdaq Composite rose 0.1 percent. Stockpiles at Cushing, Oklahoma, where New York-traded West Texas Intermediate crude is delivered, fell 742,000 barrels to 29.2 million last week, the lowest since the week end Dec. 26. Gasoline stockpiles declined 944,000 barrels to 216.5 million in the week ended April 10, according to the department. Distillate fuels, a category that includes heating oil and diesel, fell 1.17 million barrels to 139.6 million. Refineries operated at 80.4 percent of capacity, down 1.5 percentage points from the week before, the lowest since the week ended Sept. 26, when units were shut in the aftermath of hurricanes Gustav and Ike, the department said. A gain of 0.1 percentage point was forecast. The Organization of Petroleum Exporting Countries cut its forecast for global oil demand this year for an eighth consecutive month because of the economic slump. The estimate was lowered by 430,000 barrels a day from the prior month to 84.18 million barrels, the producer group said. Demand for 2009 will contract by 1.37 million barrels a day, or 1.6 percent. The International Energy Agency cut its 2009 oil-demand forecast last week for an eighth month, reducing its outlook by 1 million barrels a day to 83.4 million barrels. Brent crude oil for June settlement fell 49 cents, or 0.9 percent, to settle at $52.44 a barrel yesterday on London’s ICE Futures Europe exchange. The May contract expired at the close of trading, after losing 17 cents, or 0.3 percent, to $51.79. April 15 (Bloomberg) -- Gold and silver rose in New York as a slide in worldwide equities boosted demand for precious metals as a store of value. The MSCI World Index of stocks fell as much as 1 percent after declining 0.5 percent yesterday. Investment in the SPDR Gold Trust, the biggest exchange-traded fund backed by bullion, is up 45 percent this year as investors sought a haven from financial turmoil. “Any good move down in equities revives that safety bid for gold,” said Frank Lesh, a trader at FuturePath Trading LLC in Chicago. Gold futures for June delivery rose $1.50, or 0.2 percent, to $893.50 an ounce on the Comex division of the New York Mercantile Exchange. Earlier, the price climbed as much as 1.1 percent. The metal is up 1 percent this year. Silver futures for May delivery rose 3.5 cents, or 0.3 percent, to $12.80 an ounce. The price has gained 13 percent this year. Gold’s gains were limited on speculation that inflation will slow, eroding demand for a hedge. U.S. consumer prices in March posted their first 12-month decline since 1955, government data showed today. Gold soared 7.8 percent on March 19 after the Federal Reserve sparked concerns that inflation would accelerate by announcing plans to buy long-term debt. “We’re not fighting inflation yet, so it’s premature to buy gold for inflationary purposes,” Lesh said. Dennis Gartman, an economist and the editor of the Suffolk, Virginia-based Gartman Letter, recommended investors sell gold near the spot price of $891. “The uptrend that extends back into the lows of last November and December has been decisively broken, and since then, the most recent rally attempts have failed at progressively lower levels, while the lows are steadily lower too,” Gartman said. April 15 (Bloomberg) -- Premiums for soybeans at export terminals near New Orleans fell relative to Chicago Board of Trade futures on speculation that China will slow imports of supplies from the U.S., the world’s largest grower. Bids for barge delivery of soybeans to New Orleans this month were 46 cents to 50 cents a bushel above May futures on the CBOT, compared with 50 cents to 52 cents yesterday, U.S. Department of Agriculture data show. Cash bids for delivery next month fell 7.1 percent to an average of 52 cents a bushel over May futures from a 56-cent premium yesterday, the USDA said. Shipments to China, the world’s largest soybean consumer, may face delays after a crop-damaging virus was identified in 10 cargoes arriving in Guangzhou, a Beijing-based government agency said today. The unusually high incidence of tainted supplies may lead to tighter, longer inspections, the agency said. U.S. export sales have risen 6.7 percent since Sept. 1 from a year earlier, with China buying 57 percent of the total. About 1.228 million metric tons of soybeans already purchased by China has yet to be shipped, about 32 percent of the total of outstanding sales to all destinations, USDA data show. Soybean futures for May delivery fell 1 cent, or 0.1 percent, to $10.35 a bushel on the CBOT, after earlier reaching $10.465, the highest since Jan. 12. The most-active contract last week rose 1.2 percent, the fourth gain in five weeks. The premium of May soybean futures to the July contract fell to 3.5 cents today from 5.5 cents yesterday and the lowest since April 7. Cash-soybean prices also fell relative to futures at other major shipping points, USDA data showed. The so-called cash basis fell as much as 3 cents a bushel at export terminals in Toledo, Ohio, and by as much as 5 cents at barge loading terminals in southern Iowa; Cincinnati; Memphis, Tennessee; and St. Louis, the government said. “No one wants to get caught holding supplies with the current inverted market,” Marshall said. “Gulf demand usually slows as crops in South America become available” in April and May, when harvesting is finished in Brazil and Argentina, Marshall said. April 16 (Bloomberg) -- The dollar traded near a four-week high against the euro before U.S. reports that may show the recession is worsening in the world’s largest economy, boosting demand for the relative safety of the U.S. currency. The euro traded near a two-week low versus the yen on concern a European Union report today will show the region’s industrial production dropped by the most on record in February, supporting the case for policy makers to lower borrowing costs. The yen rose against New Zealand’s dollar on speculation the global slump will deepen, spurring investors to reduce holdings of higher-yielding assets. The dollar traded at $1.3234 per euro at 9:15 a.m. in Tokyo from $1.3227 in New York yesterday. It reached $1.3090 on April 10, the highest level since March 18. The greenback was at 99.36 yen from 99.37 yen. The euro bought 131.46 yen from 131.44 yen in New York yesterday, when it touched 129.93 yen, the weakest since April 1. Europe’s currency was at 88.10 British pence from 88.18 pence. Against the yen, New Zealand’s dollar fell 0.6 percent to 57.40. U.S. builders started construction last month on an annualized 540,000 homes, fewer than the 583,000 reported in February, economists in a Bloomberg survey said before the Commerce Department’s report today. Initial jobless claims probably rose to 660,000 in the week ended April 11, a Labor Department report is forecast to show. Industrial output in the U.S. fell 1.5 percent in March, matching February’s decrease, the Federal Reserve said yesterday. The median forecast of 76 economists surveyed by Bloomberg was for a 0.9 percent decline. The Dollar Index, which the ICE uses to track the greenback against the euro, yen, pound, Canadian dollar, Swiss franc and Swedish krona, was at 84.858 from 85.081 yesterday. The euro may weaken for a third day against the dollar as economists estimate the European Union’s statistics office in Luxembourg will say today that industrial production fell 18 percent in February from a year earlier, the biggest decline since the data series began in 1986. Investors raised bets that the ECB will reduce rates at its May 7 meeting. The yield on the three-month Euribor interest- rate futures contract for May delivery fell to 1.285 percent yesterday from 1.305 percent on April 14. Benchmark interest rates are 1.25 percent in the euro area and 3 percent in Australia and in New Zealand, making assets in the 16-nation region and the South Pacific nations attractive to international investors seeking higher returns. Japan’s benchmark borrowing cost is 0.1 percent and the U.S. rate is between zero and 0.25 percent. The yen may gain on speculation a Chinese report today will show the nation’s economy expanded at the slowest pace in nine years in the first quarter, boosting demand for Japan’s currency as a refuge. Gross domestic product grew 6.2 percent in the first quarter from a year earlier, the least since December 1999, according to a Bloomberg News survey of economists. China’s statistics bureau will release the report today in Beijing. U.S. Treasury Secretary Timothy Geithner yesterday refrained from labeling China as a currency manipulator in the department’s first semiannual report on foreign-exchange policies since he became secretary. He backtracked from an assertion he made during his confirmation hearings in January. China’s yuan closed at 6.8322 per dollar in Shanghai yesterday, from 6.8320 on April 14, according to the China Foreign Exchange Trade System. FKLI April futures contract fall marginally 3.5 points lower to close at 958.5 as compare to previous trading session with total 11,219 lots traded in the market. FKLI burst up during second trading session as regional indices and Dow Jones electronic trading reverse up during trading session. 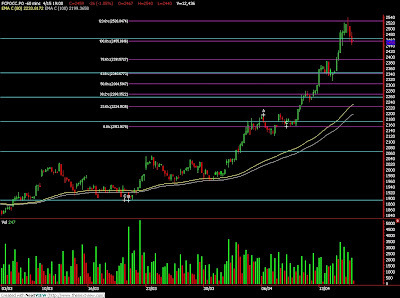 Technically, FKLI seems to encounter great selling pressure at 161.8% Fibonacci projection levels at 963.5 regions. We expect FKLI would trade lower in the coming trading session provided resistance levels at 963.5 and 970. Traders were advice to hold short position in the coming trading session while being extra alert around support levels at 947 and 938 regions. FCPO 3rd month June Futures contract fall RM26 lower to close at RM2459 as compare to previous trading session with 12,436 lots traded in the market. CPO price seems topped around RM2540 as massive profit taking activities during trading session. 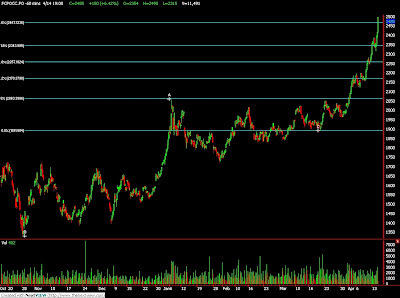 Technically, CPO seems topped around 123.6% Fibonacci projection at RM2530 regions. We expect CPO price would trade lower in the coming trading session provided resistance levels at RM2480 and RM2530 regions. Traders were advice to hold short position in the coming trading session while be extra alert around support levels at RM2400 and RM2340 regions. Reuters got the weekly grains report of the Buenos Aires Grains Exchange more than two hours before competitors. Argentina is the world’s third soy exporter and the biggest provider of soyoil and soymeal. Chicago futures moved higher after Reuters ran the story about the cut in the Exchange forecast. PARIS/SINGAPORE, April 14 (Reuters) - Chicago soybean futures edged higher to extend gains from the previous session, lifted by rising share prices and continued support from Chinese buying. "Operators will be following closely movements on financial markets this week with the publication of quarterly results by a number of banks," French analyst Agritel said in a note. JAKARTA, April 14 (Reuters) - Malaysian palm futures jumped 6.4 precent to a new high in nearly eight months amid market talk that key data, due to be released tomorrow, will show strong exports in the first 15 days of April, traders said. "The entire scene is bullish," a trader at a Kuala Lumpur-based brokerage firm said, referring to stronger exports, which may lead to a further drop in palm stocks this month. SAO PAULO, April 13 (Reuters) - Brazil's 2008/09 soybean crop was 69 percent harvested by April 9, up 8 percentage points from a week earlier, while forward sales were still well behind last year, analysts Celeres said on Monday. Harvesting progressed 3 percentage points in Mato Grosso, Brazil's top soy-producing state, where beans are sown and mature earlier than the rest of the soy belt. Harvest reached 94 percent of the expected crop, down from 99 percent a year ago. LONDON, April 14 (Reuters) - World stocks powered to fresh three-month highs after strong earnings from Goldman Sachs, while jitters about other corporate results kept government bonds and the low-yielding yen on a firm footing. "The markets have a distinctly optimistic tone this morning and are simply disinclined to engage in negative ... thinking," said Manus Cranny, senior market commentator at MF Global Spreads. NEW YORK, April 13 (Reuters) - Prices of many commodities are cuing off the equities markets' view of the economic outlook, and the correlation should continue until investors get a better read on demand for raw materials. For years, a key reason for investing in oil, copper and corn futures was the belief they would rise if stock prices fell. April 14 (Bloomberg) -- As OPEC nations make their biggest oil production cuts on record, Brazil, Russia and the U.S. are pumping more, threatening to send crude back below $50 a barrel as demand slows. U.S. imports from the Organization of Petroleum Exporting Countries fell 818,000 barrels a day, or 14 percent, to 5.02 million in January from a year earlier, according to the latest monthly report from the Energy Department. At the same time, imports from Brazil more than doubled to 397,000 and Russia’s increased almost 10-fold to 157,000, a trend that continued in February and March, according to data from each country. While the median forecast in a Bloomberg News survey of 32 analysts shows crude in New York averaging $61 a barrel in the fourth quarter, up from the second-quarter’s estimate of $50, traders are increasing bets on a decline. The fastest-growing options contract on the New York Mercantile Exchange is for prices to fall below $40 a barrel by May 14. Imports fell by 148,000 barrels a day in January just as America’s production increased by 153,000, according to data compiled by the Energy Department in Washington. More oil is flowing just as the slowing economy causes consumption to contract for the second consecutive year. The U.S. used an average of 18.9 million barrels a day in the four weeks ended April 3, down 4.4 percent from a year earlier, according to the Energy Department, the lowest level since October. Gross domestic product will contract by 3.8 percent in North America in 2009, the International Energy Agency said in a report April 10, dropping an earlier forecast for a recovery in the economy and oil demand in the second half of the year. Inventories climbed 1.65 million barrels in the week ended April 3, the highest since July 1993, U.S. government data show. Supplies are 12 percent above the five-year average for the period and are the equivalent of 25.4 days of consumption, up from 22.1 days a year ago. Open interest, or the number of outstanding contracts, on the June put option for oil to fall to $40 a barrel rose by 20 percent to 24,503 contracts in the five trading days from April 3 to April 9. A so-called put gives the owner the option to sell commodities at a predetermined price in the future. Bets that crude will drop to $45 rose by 13 percent. Crude oil futures for May delivery fell 64 cents, or 1.3 percent, to settle at $49.41 a barrel today on the Nymex. Oil is up 11 percent this year after tumbling 54 percent in 2008. OPEC agreed at three meetings last year to cut output by 4.2 million barrels a day, a 14 percent reduction to 24.845 million, as prices fell from a record $147.27 on July 11. The group reduced pumping by 1.2 percent in March, according to a Bloomberg News survey of oil companies, producers and analysts. The 11 members with quotas produced 25.06 million barrels. As shipments declined, deliveries from exporters that aren’t in OPEC rose by 670,000 barrels a day in January. Russian overall exports climbed 6.3 percent in February and 2.2 percent in March, according to the Energy Ministry. Brazilian total exports more than doubled in both February and March, according to Brazil’s Trade Ministry. Algerian Oil Minister Chakib Khelil, who held the group’s rotating presidency in 2008, said March 17 that he was disappointed Russia hadn’t cut production to support prices. Suppliers need prices in a $60-to-$75 range to support production of higher-cost resources, Saudi Arabian Oil Minister Ali al-Naimi said on March 16 in Geneva. Russia also lowered export duties this month to $15 a barrel from $15.70 in March to boost exports, the IEA said in the April 10 report. Brazilian production will rise 7.2 percent in 2009 to 2.54 million barrels a day, the IEA said. In January, Russia and Brazil earned $23.2 million a day in exports to the U.S., based on the $41.92 a barrel average on the Nymex that month. Petroleo Brasileiro SA, the state-controlled energy company, said in January that it plans to invest $174.4 billion through 2013 to boost production oil and gas production to the equivalent of 4.63 million barrels a day by 2015 from 2.40 million in 2008. Lower prices will hamper development of new sources. Total SA, Europe’s third-largest oil company, said April 6 it may postpone an investment decision in Canadian oil sands because of costs. Chevron Corp., the world’s fourth-largest energy company, delayed the start of production at three Nigerian projects and more than doubled cost estimates on some of its biggest new finds. Drilling and equipment costs remain near their 2008 peaks even as prices plunged. The U.S. will import an average 4.57 million barrels a day from OPEC in 2009, down 7.5 percent from last year, according to the Energy Department’s Annual Energy Outlook. Total imports are forecast to drop 7.3 percent this year to an average 9.02 million barrels a day. April 15 (Bloomberg) -- Crude oil fell for a third day after a report showed that retail sales in the U.S., the biggest energy-consuming country, unexpectedly declined in March. The oil market retreated after the Commerce Department reported that sales dropped 1.1 percent, and the Labor Department said prices paid to U.S. producers decreased in March after two months of gains. Futures also fell as the U.S. Energy Department and International Energy Agency cut demand forecasts. Crude oil for May delivery fell 26 cents, or 0.5 percent, to $49.15 a barrel at 8:31 a.m. Sydney time on the New York Mercantile Exchange. Oil is up 10 percent this year after tumbling 54 percent in 2008. Yesterday, crude dropped 64 cents, or 1.3 percent, to settle at $49.41 a barrel. U.S. equities dropped for the first time in four days yesterday as the declines in retail sales and producer prices offset optimism from Federal Reserve Chairman Ben S. Bernanke that the pace of the economy’s slump may be slowing. The Standard & Poor’s 500 Index slipped 1.3 percent to 847.16. The Dow Jones Industrial Average dropped 94.7 points, or 1.2 percent, to 7,963.11. An Energy Department report today may also show a decline in demand. Oil supplies rose 1.75 million barrels last week, according to the median of 14 responses in a Bloomberg News survey. Stockpiles in the week ended April 3 were the highest since July 1993 as refiners shut units for maintenance and producers outside the OPEC countries increased shipments. The industry-funded American Petroleum Institute reported yesterday that oil supplies increased last week to the highest since 1990. Stockpiles rose 6.51 million barrels to 371.2 million, API said. The report was released at 4:30 p.m. yesterday in Washington. API collects stockpile information on a voluntary basis from operators of refineries, bulk terminals and pipelines. The Energy Department requires reports to be filed for its weekly survey. The department is scheduled to release its weekly report at 10:30 a.m. today in Washington. Gasoline stockpiles probably dropped 500,000 barrels from 217.4 million the prior week, according to the survey. Gasoline futures for May delivery fell 0.56 cent, or 0.4 percent, to settle at $1.4576 a gallon in New York. Global oil demand will average 84.09 million barrels a day this year, according to the Energy Department’s Short-Term Energy and Summer Fuels Outlook, released yesterday. That’s 180,000 barrels lower than a forecast in March. The estimate is down 1.36 million barrels a day, or 1.6 percent, from demand in 2008. World consumption will decline 2.4 million barrels a day to 83.4 million this year, according to an International Energy Agency report on April 10. Members of the Organization of Petroleum Exporting Countries may take in $476 billion from oil exports this year, down 51 percent from 2008, according to the report yesterday from the Energy Information Administration, the department’s statistical arm. The estimate was increased by 24 percent from last month’s forecast of $383 billion. OPEC agreed at three meetings last year to cut output by 4.2 million barrels a day, or 14 percent, to 24.845 million. The group produced an average 27.395 million barrels a day last month, down 345,000 barrels from February, according to a Bloomberg News survey of oil companies, producers and analysts. West Texas Intermediate crude oil, the U.S. benchmark, will average $52.64 a barrel in 2009, down from $99.57 in 2008, according to the Energy Department report. Brent crude oil for May settlement declined 18 cents, or 0.3 percent, to end the session at $51.96 a barrel on London’s ICE Futures Europe exchange. April 14 (Bloomberg) -- Cash bids for soybeans at grain depots and processing plants west of the Mississippi River widened their discount to Chicago Board of Trade futures as farmers increased sales of supplies left from the 2008 harvest. Cash-basis bids in Iowa, the largest soybean-growing state, fell as much as 3 cents a bushel relative to May CBOT futures, said Troy Lust, a commercial grain broker for FCStone Group Inc. The spot bid in Des Moines was 27 cents a bushel below May futures compared with a 25-cent discount yesterday, he said. “Soybeans sales were five times that of corn today and the most in several weeks,” Lust said by telephone from West Des Moines, Iowa. Cash bids topped $10 a bushel in some locations, leading to “increased movement” of supplies from farm silos to commercial grain companies, Lust said. At export terminals in the Gulf of Mexico, bids for soybeans were little changed relative to Chicago futures. The so-called spot-basis bid, or premium, for soybeans delivered by barge this month traded at 52 cents a bushel over the May contract, unchanged from yesterday, Lust said. Bids for delivery of the oilseed next month rose to 54 cents to 58 cents over May futures from 54 cents to 55 cents yesterday, the U.S. Department of Agriculture said in a report. The cost of moving grain along the upper Illinois River to New Orleans rose to 265 percent of the 1976 published tariff rates, compared with 250 percent at the end of last week, Lust said. That would increase the cost by about 2 cents a bushel to transport grain and was reflected in weaker cash bids, he said. “There is an increase in demand for northbound barges” carrying fertilizer for spring planting, rather than barges to make the southbound journey to export terminals, Lust said. The higher freight cost was reflected in lower cash bids, he said. Soybean futures for May delivery rose 14.5 cents, or 1.4 percent, to $10.36 a bushel on the CBOT, after earlier touching $10.435, the highest since Jan. 12. Prices rose on signs of increased exports as U.S. inventories head for the lowest level in five years. Exports have climbed as a drought cut output in Brazil and Argentina, the biggest shippers after the U.S. Last week, the USDA said global production will be 2 percent less than it forecast in March, citing smaller South American crops. The USDA estimated U.S. stockpiles on Aug. 31 will be 165 million bushels, down 20 percent from a year earlier. U.S. exports will reach a record 32.9 million tons, up from 32.25 million projected in March, the USDA said on April 9. That compares with 31.6 million shipped in the previous year. The premium for May futures over the July contract fell to 5.5 cents, down 0.25 cent from yesterday’s 5.75 cents, the highest for this marketing year. “The market is trying to solve a tightening supply problem,” Lust said. “Cash values along the river system are about 4 to 5 cents above delivery,” reducing the incentive for commercial grain companies to make delivery against May futures later this month, Lust said. April 14 (Bloomberg) -- Gold fell in New York on speculation that the U.S. economy will rebound, eroding the appeal of the precious metal as an alternative asset. Silver was little changed. Federal Reserve Chairman Ben S. Bernanke said there are signs that the “sharp decline” in the economy may be easing, and President Barack Obama said the stimulus package is beginning to “generate economic progress.” Before today, investment in the SPDR Gold Trust, the biggest exchange-traded fund backed by bullion, had risen 45 percent this year to a record as investors sought a haven from financial turmoil. Gold futures for June delivery fell $3.80, or 0.4 percent, to $892 an ounce on the New York Mercantile Exchange’s Comex division. The metal has risen 0.9 percent this year. Silver futures for May delivery fell 0.3 cent to $12.765 an ounce in New York. Silver has gained 13 percent this year. For gold prices to remain high, investment demand must not stall, analysts at Societe Generale said today in a report. Bullion held in the SPDR Gold ETF was unchanged at a record 1,127.68 metric tons for a second day. “If buying momentum is not re-ignited, and there is a case for suggesting the major surge is out of the way, then prices will come down,” Societe Generale said. Gold rose to $1,007.70 an ounce on Feb. 20, the highest price this year. The most-active contract touched a record $1,033.90 on March 17, 2008. Societe Generale expects gold to average $750 in this year’s fourth quarter. Gold’s losses were limited after a report showed U.S. retail sales fell 1.1 percent in March from February. The median estimate of 73 economists surveyed by Bloomberg News was for a 0.3 percent gain. Retail sales rose 0.3 percent in February, the government said, revising an earlier estimate of a 0.1 percent decline. U.S. equity indexes retreated while shares in Europe rose. The Standard & Poor’s 500 Index slumped as much as 2.2 percent after five straight weekly gains. April 15 (Bloomberg) -- The yen traded near a two-week high against the dollar before U.S. reports that economists say will show industrial output declined for a fifth month and a gauge of manufacturing contracted. The euro may decline for a second day versus the pound on concern a German report may show wholesale prices dropped for an fifth month, supporting the case for the European Central Bank to lower interest rates. The yen was also near the strongest in a week against the euro on speculation a decline in U.S. stocks will spur investors to reduce holdings of higher-yielding assets. “The markets are returning to reality from an exuberant state,” said Ryohei Muramatsu, manager of Group Treasury Asia in Tokyo at Commerzbank AG, Germany’s second-biggest bank. “This is just a correction, which is leading to some buying of the yen,”, he said. The yen traded at 99.08 against the dollar at 9:17 a.m. in Tokyo from 98.98 in New York yesterday. It earlier reached 98.74, the highest level since April 2. Japan’s currency was at 131.44 per euro from 131.25. The dollar bought $1.3267 per euro from $1.3259. The euro was at 88.99 pence from 89.01 pence. The yen may advance to 98.50 against the dollar and 130.80 per euro today, Muramatsu said. The Standard & Poor’s 500 Index dropped 2 percent yesterday as Goldman Sachs Group Inc. fell 11 percent after raising $5 billion in a share sale to help repay $10 billion in government rescue funds. Benchmark rates are 0.1 percent in Japan and as low as zero in the U.S., compared with 3 percent in Australia and in New Zealand, making assets in the South Pacific nations attractive. U.S. industrial production fell 0.9 percent in March, according to a Bloomberg News survey before the Federal Reserve report today. The Fed Bank of New York’s Empire State index of manufacturing, also due today, was minus 35 in April, a 12th month of contraction, a separate Bloomberg survey shows. The euro traded near a five-week low against the pound before Germany’s Federal Statistics Office releases its report on wholesale prices today. Prices fell 7.1 percent in March from a year earlier, after a 5.7 percent drop the previous month, according to a separate Bloomberg survey. “If inflation threatens to remain significantly below 2 percent for a considerable period of time, then additional policy easing could be warranted to counter that eventuality,” Athanasios Orphanides, a European Central Bank council member, said in an April 11 interview in Nicosia. The ECB cut its benchmark interest rate on April 2 less than economists forecast, reducing it by a quarter-percentage point to 1.25 percent. Fed Chairman Ben S. Bernanke said yesterday the dollar will keep its role as world’s main reserve currency for the “foreseeable future.” He responded to a question after a speech in Atlanta. FKLI April futures contract surge 18 points higher to close at 962 as compare to previous trading session with total 9,546 lots traded in the market. FKLI manage to surge higher during trading session despite regional indices and Dow Jones electronic trading doesn’t seems participate in the rally. 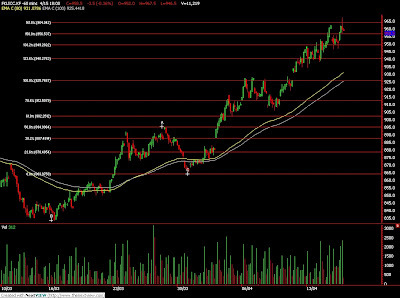 Possible it’s due to plantation counter traded higher as CPO price was traded higher during trading sessions. 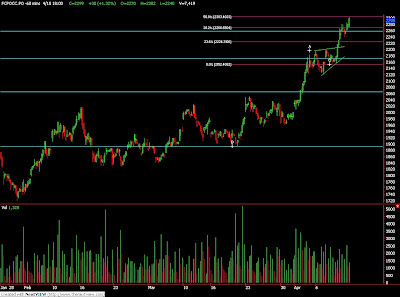 Technically, FKLI seems to breach 150% Fibonacci projection resistance levels at 956 but manage to close around 161.8% Fibonacci projection levels at 963 regions. 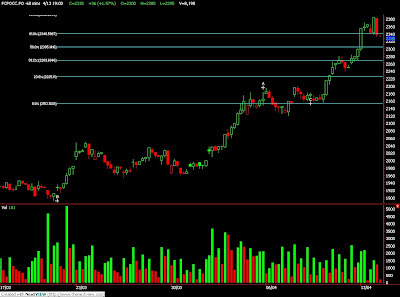 We expect FKLI was slightly on the top side as provided resistance levels at 963.5 and 973 were not violated. 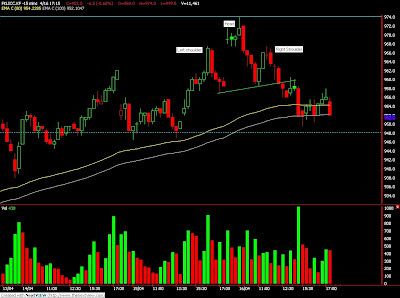 Traders were advice to hold short position once support levels at 953 and 938 were breach in the coming trading session. FCPO 3rd month June Futures contract surge RM150 higher to close at RM2485 as compare to previous trading session with 11491 lots traded in the market. CPO price continue to rally upwards for the 4th trading days despite crude oil trading was closed weak during the trading session. Technically, CPO yesterday breached 2 previous major resistance levels at RM2340 and RM2465 regions. We expect CPO price still riding on a bull rally and reversal signal yet to appear in the hourly chart. Traders were advice to hold long position while being extra cautious around resistance levels at RM2625 and RM2800 regions while put tight stop order around support levels at RM2450 and RM2400 regions. April 14 (Bloomberg) -- As OPEC nations make their biggest oil production cuts on record, Brazil, Russia and the U.S. are pumping more, sending crude back below $50 a barrel as demand slows. Nymex futures for May delivery fell as much as 47 cents, or 0.9 percent, to $49.58 a barrel before trading at $49.62 at 10:12 a.m. in Singapore. April 14 (Bloomberg) -- The yen and the dollar rose against higher-yielding currencies on speculation the global recession will deepen, spurring investors to seek safer assets. The yen gained for the fifth time in six days against the euro after Singapore said its economy may shrink the most since independence in 1965 and on speculation a report this week will show China’s economy cooled to the slowest in almost a decade. The euro halted two days of gains versus the greenback on concern a German report tomorrow will show wholesale prices fell for an eighth month, supporting the case for the region’s central bank to cut interest rates. The yen rose to 133.15 per euro as of 6:32 a.m. in London from 133.81 in New York yesterday. Japan’s currency climbed 0.8 percent against the Australian dollar to 72.68, and advanced 0.7 percent versus New Zealand’s dollar to 58.91. It climbed to 99.76 versus the dollar from 100.10. The dollar strengthened to $1.3349 versus the euro from $1.3368 yesterday. The Nikkei 225 Stock Average dropped 0.8 percent and Standard & Poor’s 500 Index futures fell 0.9 percent. Sumitomo Realty & Development Co., Japan’s third-largest developer, sank 5.7 percent in Tokyo after missing its profit target. The euro declined the most against the yen in almost a week before Germany’s Federal Statistics Office releases its report on wholesale prices tomorrow. Prices slumped 7.1 percent in March from a year earlier, according to a Bloomberg News survey of economists. Europe’s single currency also weakened on concern European Central Bank officials this week will signal they may keep lowering rates to support growth. Council member Axel Weber will speak in Hamburg tomorrow and Erkki Liikanen will deliver a speech in Helsinki the following day. ECB President Jean-Claude Trichet said last week the central bank is studying unorthodox ways of boosting the economy. “The euro remains laden by expectations of another rate cut and the prospect of unconventional monetary easing,” Emmanuel Ng, a Singapore-based economist at Oversea-Chinese Banking Corp., wrote in a research note to clients today. Singapore’s economy may shrink as much as 9 percent this year, the trade ministry said today in a statement, reducing its forecast for the third time since early January. China’s economic growth slowed to 6.2 percent in the first quarter from a year earlier, according to economists surveyed by Bloomberg News, from 6.8 percent the previous three months. The report is due on April 16. Singapore’s dollar climbed against all of the 16 most- active currencies after the city-state’s central bank said in its twice-yearly policy review that it sees no reason for “any undue weakening” of the local currency. The Monetary Authority of Singapore “re-centered” the trading band in which the local dollar is managed and said it doesn’t plan to seek either appreciation or depreciation. Singapore’s dollar advanced 1.1 percent to S$1.4998 versus the greenback after touching S$1.4963, the strongest level in two months. The Singapore dollar had largely moved in the lower half of the previous policy band since the previous review in October, the central bank said. Gains in the yen may be curbed on speculation the so-called carry trade is making a comeback after its longest losing streak in three decades. Stimulus plans and near-zero interest rates in developed economies are boosting investor confidence in emerging markets and commodity-rich nations with interest rates as much as 12.9 percentage points higher. Using dollars, euros and yen to buy the currencies of Brazil, Hungary, Indonesia, South Africa, New Zealand and Australia earned 8 percent from March 20 to April 10, that trade’s biggest three-week gain since at least 1999, data compiled by Bloomberg show. Goldman Sachs Group Inc., Insight Investment Management and Fischer Francis Trees & Watts have begun recommending carry trades, which lost favor last year as the worst financial crisis since the Great Depression drove investors to the relative safety of Treasuries. Now efforts to end the first global recession since World War II are sending money into stocks, emerging markets and commodities. SINGAPORE, April 13 (Reuters) - Chicago soybean futures rose about 1 percent on Monday, extending last week's rally, which lifted the market to a 2-½ month high, as a report predicted lower closing stocks in the United States on strong global demand. "The soy market is really strong, it's a good buying opportunity," said Kaname Gokon, a manager with broker Okato Shoji Co. in Tokyo. "We have a price forecast of $10.50 a bushel by the end of this week for the May contract." MOSCOW, April 13 (Reuters) - Russian grain export prices strengthened slightly last week on rising export demand, while domestic prices continued to decline gradually as stocks remained high, analysts said on Monday. "Last week saw a certain revival of exporters' activity in the southern part of Russia and certain traders raised prices," SovEcon agricultural analysts said. AMMAN, April 13 (Reuters) - Iraq's Umm Qasr port is taking delivery of 88,000 tonnes of long grain Vietnamese, Uruguay and Thai rice that were purchased late last year, shipping sources said on Monday. They said the port began on Saturday unloading a vessel carrying 26,000 tonnes of Vietnamese rice in addition to two vessels that were already discharging since the start of the month a total of 62,000 tonnes of Thai and Uruguay origin rice. HANOI, April 13 (Reuters) - The winter-spring paddy rice output in Vietnam's Mekong Delta is expected to rise 10.8 percent from last year to 10.4 million tonnes, thanks to higher yields, beating previous expectations, a state-run newspaper said. The average yield rose nearly 5 percent to 6.5 tonnes per hectare that produces Vietnam's top quality grain, Monday's Tin Tuc (News) daily quoted Le Van Banh, director of the Cuu Long Delta Rice Institute, as saying. TEHRAN, April 12 (Reuters) - Iran imported 5.9 million tonnes of wheat in the 2008-09 year, of which about 15 percent came from its old foe the United States, an Iranian business daily reported on Sunday, citing customs data. Iran stopped buying U.S. wheat after the Iranian revolution in 1979 which ousted the pro-U.S. government. But one official said in November Iran was importing wheat from the United States via intermediaries. His comments were the first official admission that such an indirect trade was taking place. JAKARTA, April 13 (Reuters) - Malaysian palm futures rose 1.6 percent on Monday on signs of tighter stocks, but were off intraday peaks after touching a fresh 7-month high as investors locked in profits from a recent rally, traders said. "People think the market is massively overbought. The rally is fundamentally justified on the tightness of stock in the market for vegetable oils. But the way the market moved is too fast," said a trader at a Kuala Lumpur-based brokerage. BEIJING, April 13 (Reuters) - A cooperation deal between China Sinograin Oils Corp and Japan's Marubeni Corp will give China another channel for imports of soybeans, the head of the Chinese firm told Reuters on Monday. But the deal does not cover other grains, such as wheat and corn, and Sinograin has not committed to buying any volume from the Japanese trading house. BEIJING, April 10 (Reuters) - China's demand for imported soybeans slowed this week following a surge in international prices while the soyoil market became weak on ample supply, an official survey showed on Friday. Traders expected domestic soyoil demand to fall in coming weeks following huge arrivals of soybeans and more supplies from crushers, the China National Grain and Oils Information Centre (CNGOIC) said. TOKYO, April 13 (Reuters) - Asian stocks rose on Monday on hopes for the global economy, with Taiwan shares hitting a near 7-month closing high, while oil prices slipped below $52 after a dramatic oil demand downgrade by the International Energy Agency. "The world is watching this, and with stock markets likely to move strongly in response, nobody wants to either buy or sell actively today," said Masayoshi Okamoto, head of dealing at Jujiya Securities in Tokyo. April 14 (Bloomberg) -- Oil fell below $50 a barrel, extending yesterday’s 4.2 percent loss, after the International Energy Agency forecast that 2009 demand may slump to the lowest level in five years amid the global economic recession. Consumption will decline 2.4 million barrels a day this year, about the same amount that Iraq produces, to 83.4 million barrels a day, according to the IEA report on April 10. U.S. crude oil supplies are at their highest since July 1993, the Energy Department said on April 8. Crude oil for May delivery fell 27 cents to $49.78 a barrel at 8:21 a.m. Sydney time on the New York Mercantile Exchange. Prices are up 12 percent so far this year after tumbling 54 percent in 2008. Oil fell $2.19 yesterday to settle at $50.05 a barrel, in the biggest drop on the Nymex since March 30. Oil demand will shrink by 2.8 percent this year as worldwide gross domestic product declines by 1.4 percent, according to the IEA, the adviser to 28 consuming countries. The organization had until now assumed the global economy would expand in 2009. The report was issued April 10, when international financial markets were closed for Good Friday. The pace of contraction is close to early 1980s levels, although a repeat of four consecutive annual declines seen during that period is unlikely, the Paris-based agency said in its monthly report. The recovery of both the economy and energy demand will be deferred until 2010, according to the IEA. Iran’s OPEC governor said the producer group may cut oil output again when ministers next gather if demand falls further, Hamshahri, an Iranian newspaper, reported. The Organization of Petroleum Exporting Countries is scheduled to hold its next meeting in Vienna on May 28. “If demand continues to decrease until the next meeting of the group, a further output cut will be possible,” Mohammad Ali Khatibi was quoted as saying by the Tehran-based newspaper. OPEC reduced daily output targets by 4.2 million barrels since September to prevent a glut and bolster prices. U.S. crude-oil supplies increased 1.65 million barrels to 361.1 million in the week ended April 3, the report from the Energy Department showed. Supplies probably rose 2 million barrels last week, according to the median of 10 responses in a Bloomberg News survey. Gasoline stockpiles probably dropped 750,000 barrels from 217.4 million the prior week, according to the survey. Distillate fuels, a category that includes heating oil and diesel, probably fell 1 million barrels from 140.8 million. Gasoline futures for May delivery dropped 1.78 cents, or 1.2 percent, to settle at $1.4632 a gallon in New York. Heating oil for May delivery fell 3.08 cents, or 2.2 percent, to end the session at $1.398 a gallon. Brent crude oil for May settlement fell $1.92, or 3.6 percent, to end yesterday’s session at $52.14 a barrel on London’s ICE Futures Europe exchange. Brent is trading at a $2.09-a-barrel premium to the West Texas Intermediate contract in New York, swinging from a discount of 43 cents on March 31. April 14 (Bloomberg) -- The yen fell to a one-week low against the euro on speculation that the worst of the global financial crisis is over, prompting investors to purchase higher-yielding assets financed in Japan. The Japanese currency declined for a second day versus the Australian and New Zealand dollars on prospects that U.S. banks this week will disclose better first-quarter results than some analysts estimate, boosting demand for so-called carry trades. An index tracking the dollar versus the currencies of six major U.S. trading partners dropped the most in more than three weeks on decreased demand for the safety of the greenback. “There are hopes that U.S. banks will reveal better-than- expected earnings, which may allay worries over the crisis,” said Masanobu Ishikawa, general manager of foreign exchange at Tokyo Forex & Ueda Harlow Ltd., Japan’s largest currency broker. “The bias for the yen is to weaken” to 100.50 against the dollar and 134.00 per euro today, he said. The yen traded at 134.21 per euro, the lowest level since April 7, at 8:52 a.m. in Tokyo from 133.81 in New York yesterday. Japan’s currency was at 100.36 versus the dollar from 100.10. Against the yen, Australia’s dollar traded at 73.41 from 73.25 and New Zealand’s dollar was at 59.43 from 59.30. The euro fetched $1.3371 from $1.3368 in New York yesterday when it touched $1.3373, the strongest since April 7. The Dollar Index fell 1.3 percent yesterday to 84.635, the biggest decrease since March 19. The ICE uses the index to track the greenback against the euro, yen, pound, Canadian dollar, Swiss franc and Swedish krona. After financial markets closed yesterday, Goldman Sachs Group Inc. reported first-quarter earnings of $1.81 billion, or $3.39 a share, exceeding the average analyst estimate of $1.64 a share. Goldman Sachs, Citigroup Inc., and JPMorgan Chase & Co. are among more than 30 Standard & Poor’s 500 companies scheduled to announce results this week. In carry trades, investors get funds in a country with relatively low borrowing costs and invest in another with higher interest rates. The risk is market moves can erase those profits. The benchmark interest rate is 0.1 percent in Japan, compared with 3 percent in Australia and in New Zealand. FKLI April futures contract retrace 2 points lower to close at 944 as compare to previous trading session with total 6,016 lots traded in the market. FKLI manage to trade higher during trading session but close lower due to Dow Jones electronic and regional indices trading were traded lower. 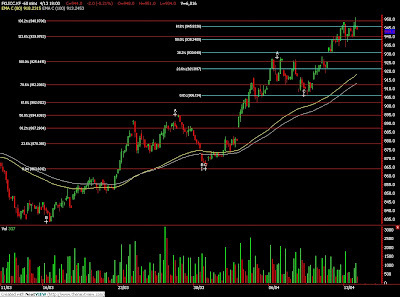 Technically, FKLI seems stopped around 138.1% Fibonacci projection at 949 regions. We expect FKLI is around the top side at 956 regions. Traders were advice to hold short position in the coming trading session provided FKLI not capable to breach resistance levels at 956 and 963 regions. Supports were seen at 935 and 928 regions. FCPO 3rd month June Futures contract rose RM36 higher to close at RM2335 as compare to previous trading session with 8198 lots traded in the market. CPO price manage to trade higher during the trading session despite crude oil electronic trading plunge during trading Asia trade. MUMBAI, April 13 (Reuters) - Indian soybean and soyoil futures may trade higher on Monday tracking a firm Malaysian palm oil, analysts said. May soybean NSBK9 on the National Commodity and Derivatives Exchange last ended at 2,630.5 rupees per 100 kg, up 1.44 percent, while May soyoil NSOK9 closed up 1.7 percent at 484.7 rupees per 10 kg. April 13 (Bloomberg) -- Crude oil fell in New York after the International Energy Agency cut their 2009 demand forecast to the lowest since 2004 because of the global recession. Oil consumption will fall by 2.4 million barrels a day this year, about the same amount that Iraq produces, to 83.4 million barrels a day, the IEA said on April 10. Trading in New York and London was closed that day for the Good Friday holiday. U.S. crude supplies are at their highest since July 1993, the Energy Department said on April 8. Crude oil fell as much as 62 cents, or 1.2 percent, to $51.62 a barrel in electronic trading on the New York Mercantile Exchange. It was at $52.00 a barrel at 6:55 a.m. Singapore time. The contract closed 5.8 percent higher at $52.24 on April 9 as equities gained, signaling that some investors expect economies to stabilize, bolstering energy demand. Oil demand will shrink by 2.8 percent this year as worldwide gross domestic product shrinks by 1.4 percent, according to the IEA, the adviser to 28 consuming countries. The organization had until now assumed the global economy would expand in 2009. The decline outpaces supply from OPEC’s third- largest producer, Iraq, which last month pumped 2.27 million barrels a day. “The pace of contraction is close to early 1980s levels, with a growing consensus that economic and oil demand recovery will be deferred to 2010,” the Paris-based adviser said in its monthly report. April 13 (Bloomberg) -- The yen fell to a six-month low against Australia’s dollar on optimism the global financial crisis is easing, spurring investors to buy higher-yielding assets financed with the Japanese currency. The yen also weakened against the New Zealand dollar on speculation U.S. banks will this week post better-than-expected results for the first quarter, boosting demand for so-called carry trades. The euro traded near a three-week low against the dollar on concern European Central bank officials this week will signal they will cut interest rates further. “Risk-taking appetite may keep improving as first-quarter earnings at U.S. banks could prove to be good,” said Yuji Saito, head of the foreign-exchange group in Tokyo at Societe Generale SA, France’s third-largest bank. “The bias would be for the yen to be sold” to 101 against the dollar and 132.50 per euro today, he said. The yen declined to 72.34 against Australia’s dollar as of 9:13 a.m. in Tokyo from 72.11 in New York on April 10. It touched 73.10, the lowest level since Oct. 14. Japan’s currency fell to 58.54 per New Zealand dollar from 58.46. It traded at 100.28 versus the U.S. dollar from 100.24, and was at 131.85 per euro from 132.18. The euro traded at $1.3148 from $1.3189 on April 10 when it reached $1.3090, the weakest since March 18. Europe’s currency was at 89.94 British pence from 89.84 pence. Against the pound, the greenback gained to $1.46127 from $1.4672. Exchange-rate movements may be more volatile than normal as the Easter holiday in Asia and Europe reduces the volume of trading, Saito said. Goldman Sachs Group Inc. will release its first-quarter results tomorrow and JPMorgan Chase & Co. will disclose its first-quarter earnings on April 16. Wells Fargo & Co., the second-largest U.S. home lender, said last week first-quarter net income surged 50 percent because of “strong” revenue from Wachovia Corp., which it acquired last year. In carry trades, investors get funds in a country with low borrowing costs and invest in another with higher interest rates. The risk is that market moves can erase those profits. The benchmark rate is 0.1 percent in Japan, compared with 3 percent in Australia and in New Zealand. The euro may extend last week’s losses on speculation ECB policy makers will signal they may lower borrowing costs for a fourth time this year when they meet next month. ECB council member Nout Wellink said last week the central bank can make additional cuts to its 1.25 percent rate and is considering other measures to spur lending and boost the economy. Fellow members Axel Weber will speak in Hamburg on April 15 and Erkki Liikanen will speak in Helsinki the following day. Investors last week raised bets the ECB will reduce rates at its May 7 meeting. The yield on the three-month Euribor interest-rate futures contract for May delivery fell to 1.31 percent on April 9 from 1.39 percent on April 3, according to data compiled by Bloomberg. FKLI April futures contract continue to surge 20.5 points higher to close at 946 as compare to previous trading session with total 7,050 lots traded in the market. FKLI surge up higher despite being driven neither by regional indices nor Dow Jones futures electronic trading. 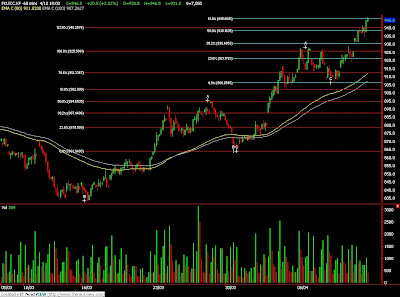 Technically, FKLI seems temporary stopped around 61.8% Fibonacci projection resistance levels at 945 regions. We expect FKLI would encounter great selling pressure around 78.6% regions at 956 levels as it also complete 150% Fibonacci projection levels for major count. 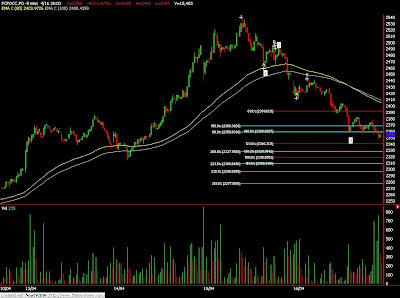 Traders were advice to hold long position provided in the coming trading session while be extra alert around support levels at 937 and 905 regions. FCPO 3rd month June Futures contract surge RM30 higher to close at RM2299 as compare to previous trading session with 7419 lots traded in the market. CPO continues to ride on the bull rally despite soybean oil and crude oil electronic trading was closed for Good Friday. Technically, CPO price seems challenge 50% Fibonacci projection for minor wave count at RM2304 regions. We expect CPO price would test next resistance levels at RM2340; 61.8% Fibonacci projection for minor wave count to complete major wave count also at 61.8% projection levels. 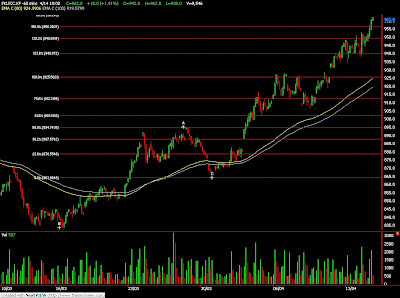 Traders were advice continue to hold long position once the resistances levels were breach while be extra cautious around support levels at RM2240 and RM2200 regions.